Staying indoors is hardly an option when the weather gets hot and muggy. It’s much better to shoot the breeze with friends and family outside on your deck. An awning will shield you from the worst of the sun, and keeps you dry from inclement weather as well. What most people don’t realize is that knowing how to build an awning is actually much easier than it appears. There’s no need to shell out big bucks to build a simple shade! A simple awning that extends from the side of a house can be made with canvas or plastic. If your budget is a real concern, then tarp is a cheaper alternative. Other materials you will need in order to save yourself a few thousand dollars include grommets, extendable tent poles, screw hooks, key rings, nylon thread and rope, a sewing machine or a large needle, and an electric drill. 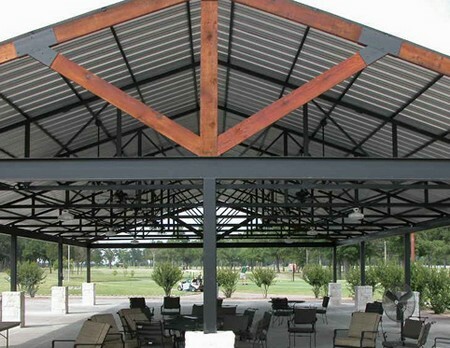 The first part of how to build an awning is to determine the area you want it to cover. You should measure out this area on the ground and use this measurement to purchase your shade material (canvas, plastic or tarp). The shade material you buy should measure slightly larger than the covered area in order to provide allowance for hemming. Hemming the shade material prevents it from fraying and enables the awning to last longer. Fold in each edge of the material about an inch and sew the hem with a straight running stitch. Nylon thread should be used because it too is more durable and resistant to weather conditions than cotton thread. A grommet is to be installed at each corner of the shade material after its edges have been hemmed. The distance between the grommets on the side of the awning that is to be attached to your house are used to determine where the pilot holes should be drilled before the screw hooks are inserted. Pilot holes are important to stop the wooden siding of your house from splitting and aid accurate insertion of the screws. Use key rings, one through each grommet, to attach them to the screw hooks affixed to the house. To determine where to situate each tent pole, stretch the shade material out and mark the spots. Tent poles can be fixed to the ground or rest on top of it on flat ends. After the poles have been set up, the shade material is attached by hooking one pole to the grommets on each remaining corner. The remainder that needs to be done when you learn how to build an awning is to tether it. Two sections of nylon rope are tied to each grommet fastened to a pole. One section is pulled to the front and staked to the ground, while the second section is staked to the ground at right angles to the first section of rope.